The HangUps Storage Cabinet Collection offers versatility for your ever changing storage needs in the garage, laundry room, office or workshop. The Cabinets mount securely to the wall with a heavy duty metal rail and hook system. The wall mounted feature ensures easy cleaning beneath the cabinets and protects your stored items from water and dirt. The HangUps Collection is constructed using laminated composite wood and features metal handles and adjustable hinges. This product ships ready-to-assemble and includes all hanging rails and fastening bolts. A great addition to your garage or workshop, the Pro Series Cabinet Set features frames made of 18-Gauge steel and 19-Gauge double wall doors. The redesigned full length easy grab handles on the fully lockable doors offer a great modern look for any garage. The floor cabinets come with adjustable legs to keep cabinet's level or you may choose to mount the cabinets on the wall. Worktops are 1.25-inch T and are available in stainless steel with a solid wood core or solid bamboo. Integrated cable access holes in lockers and base cabinets for an easy way to charge your tools and valuables behind locked doors. Integrated cable access holes in the Locker and base cabinets for an easy way to charge your tools and valuables behind locked doors. Each cabinet arrives to your home fully-welded for easy installation, just add legs (optional) and position. Because every work and storage space is unique; our cabinets feature fully-adjustable levelling legs and perforated back-panels for easy positioning and wall-mounting. The Pro series also features easy wall hanging brackets to help get your cabinets setup. 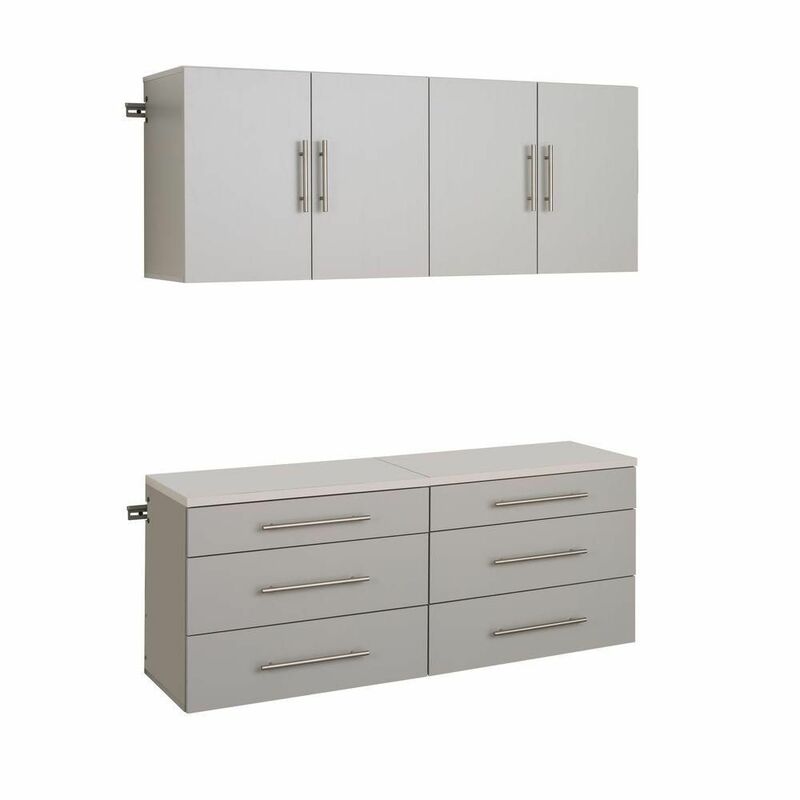 HangUps 60 Inch Storage Cabinet Set F - 4pc The HangUps Storage Cabinet Collection offers versatility for your ever changing storage needs in the garage, laundry room, office or workshop. The Cabinets mount securely to the wall with a heavy duty metal rail and hook system. The wall mounted feature ensures easy cleaning beneath the cabinets and protects your stored items from water and dirt. The HangUps Collection is constructed using laminated composite wood and features metal handles and adjustable hinges. This product ships ready-to-assemble and includes all hanging rails and fastening bolts.